Rewards Canada: April 11 Update: New Starbucks program starts tomorrow, Marriott & Starwood deal finalized, Toronto flight bonuses! April 11 Update: New Starbucks program starts tomorrow, Marriott & Starwood deal finalized, Toronto flight bonuses! Just a reminder that the new Starbucks Rewards launches tomorrow. You will no longer earn stars per transaction but rather on how much you spend. Read all the details on our post from February. 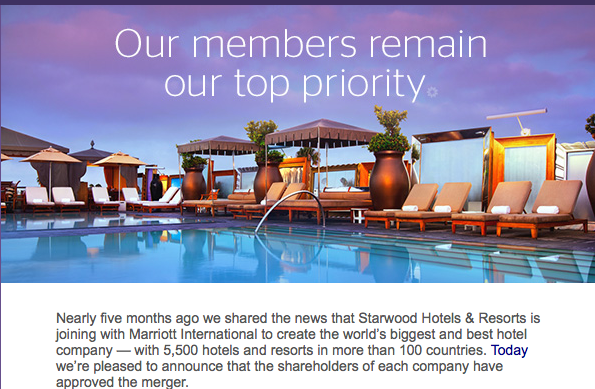 Last last week Starwood Hotels shareholders approved the takeover by Marriott. I'm sure you've all seen the email from SPG and/or Marriott. If not essentially the major news is that Starwood Preferred Guest will more than likely cease to exist in its current form sometime in 2018. So you don't really have to panic now and can continue to earn/burn and enjoy SPG benefits for nearly two more years. When SPG and Marriott Rewards get combined into a new program that according to Marriott and Starwood will provide the best of both programs. Getting answers to these complicated, important questions will take time. In fact, we don’t anticipate launching a newly combined program until 2018. This means SPG will continue to run separately until then. In the meantime, we're actively exploring ways to build bridges between the two programs to further enhance your experience. You can keep up to date on the integration process here.